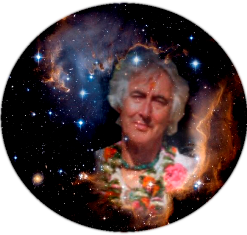 I’ve mentioned here before that back in the 80’s I relocated to Boulder, Co, and joined the core team that created the global Harmonic Convergence event, as dreamed into manifestation by visionary artist and Mayan “son,” Jose Arguelles. I’m feelin it, y’all. The experience of living is changing as I become more and more woke. The events of my life have taken on a familiar quality, like I’m re-watching a movie I forgot I saw long ago. There’s the strange, sometimes unsettling sense that all of this has already happened — not just snippets of Déjà vu but an overarching feeling that I went through living and dying and the credits rolled on the screen but when they did I was a very different person. Back then, I could follow the story but I never got its deeper meaning. I know many others are experiencing this shift in perspective as well. There are messages in art, but also in ads, and in silly TV shows, and on the back of food wrappers and in the steady eyed stare of a child. It’s as though the whole universe is trying desperately to tell us something by any means necessary. It’s bigger than the never ending fear that’s sold on the news, it’s bigger than the weather report. It’s the birth of a new era of joy — and it’s not easy to put into words what’s happening, but that’s what I’m going to try and do here. There are many different ways to tell it, but one interpretation of what’s happening is that we’re moving from an era in which “time is money”, into one in which “time is art”. This is a part of a far bigger philosophy developed by the late Jose Arguelles, whose largely overlooked body of work changed my life and will one day soon, I believe, be considered ahead of its time in its description of a new, more psychically connected and joyful way of being. Arguelles made the observation that from our clocks to our calendars to our computers, humans seek to control time (and one another) by treating it like something mechanical and quantifiable. In doing so, Arguelles argues that we’ve lost touch with the flow of natural time, including the 28 day, 13 month cycle of the moon and the changing seasons. To be disconnected from natural time is to be disconnected from the experience of our oneness with the Earth and everything on it. This, he argued in a series of beautiful, captivating books, was the central glitch in our system and the reason for most, if not all, of the pain and suffering we feel. To fix this glitch would be like fixing the alignment of an otherwise well-running car — instead of the parts grinding against one another, everything would fit and flow as it was meant to. The idea that we can change our understanding of time and transform our experience of being in the world is nothing short of revolutionary. Time is one of the constants that underpins our lives — to question the nature of its existence is to question such basic things like why we breathe, or the fact that there is day and night. But once we start investigating what time really is, the effect is such that our entire understanding of the world is changed. We see how deeply we’ve accepted that “time is money”, in that money and the pursuit of it dictates how we spend most of our time, whether we like it or not. We’re born into a world in which we have to pay just to live — buying or renting a house and shopping for groceries while saving enough to pay for the water bill. This is the so-called normal state of affairs, but if we stop and think about it, even for just a little bit, it strikes most of us as far less than optimal and quite possibly misguided and insane. Although it’s less clear to most what “time is art” means, there’s something about it that immediately inspires. I watch people’s eyes light up when they hear it— as though this was a forgotten bit of information they know is true on an intuitive level. But what does it mean practically? How can we actually live our lives like works of art, especially if we aren’t trained to be artists? I doubt that what Arguelles envisioned was a world filled with crappy, second and third rate art. For him, the calendar came first: he believed that if we dropped the Gregorian calendar and went back to the advanced time-keeping abilities of the ancient Mayans, we’d start the process of complete transformation towards living time as art. While I believe he was probably right, and that by changing the way we keep time we’d change the way our minds work, I long had the hunch that attempting first to live time as art might be more feasible than actually converting the whole world to a new calendar system. Now I see that’s exactly what’s happening — I see time is art all around me. I’ve read about it, obsessively thought about it and wrote about it myself — I even made a documentary film about it — but the question of what it means to truly embody “time is art” has become clear to me only now, as the blockbuster ending of a long, twisted story plays out across America and the world. It’s precisely because things have become so dark on such a large scale that the opportunity to make this change is more available than ever. It’s a journey that each of us as individuals must take to come to the peace and higher vibe of living time as art. This has always been the case. The invitation has been going out since the beginning of time, but only the most sensitive among us could hear it — the poets, philosophers, artists and mystics. Their gift of being able to tune in and hear what others could or would not hear lifted them up to the stars with inspiration and dropped them to the depths of hell with madness, as they were often misunderstood and damned by society because of it. In order to hear it one has to step out of the noise and “blah, blah, blah” busyness of the everyday. Ironically, this becomes easier to do during difficult times when the flimsy pasteboard structures and routines of life as we know it falls apart, and we’re forced to listen and pay attention to the larger story of the biosphere — not just as a big blue orb that we happen to live on, but that is actually a part of us. This is a worldwide revolution that starts with a collective act of opening up to connect with nature and one another. In doing so, we will quickly reactivate long forgotten abilities. As the resistance to Trump continues to grow, we’re discovering that just by gathering together, sharing space and loving one another without judgement we start to feel better— but I don’t think we’ve yet fully grasped the epic scale of the collective transformation that’s currently underway. In addition to feeling healthier and more empowered, we’re also realizing that the power to communicate psychically and heal ourselves and one another are no longer the domain of made-up superheroes. These are things the most ordinary person can do. It seems crazy but it’s true: all those comic book stories we told were really about US. In the same way that Superman must tear apart his capitalist uniform/suit jacket to reveal the “S” on his chest, we must do the difficult, personal work of opening up our scared, wounded hearts. In the era of time equaling money, the heart was subjugated to the so-called rationality of the mind. It’s more advanced capacities were closed off in a prison of man-made shame and judgments. Now, in this new era, long suppressed creative impulses and love for the earth and one another are rising like a phoenix from the destruction of the old, broken paradigm. The invitation for our species to change and evolve is being downloaded directly into each of our consciousness. It’s coming through dreams and synchronicities. Through vibes and by falling in love. This isn’t about a mental realization. Instead, we’re each being asked as individuals to shift our consciousness to meet the higher level frequency of the broadcast that the earth has been sending out. This surreal state we’ve entered is part of the process of remembering who we are. The Grand Swindle of the last several centuries has included the wholesale covering up of our magic powers. My intention is to document this awakening. I want to explore this collective shift from darkness to a sustained, empowering experience of joy. This new blog baby will be a curated offering exploring my own and others’ experiences of living time as art and in the process, evolving into better versions of ourselves. Art is and always has been a guide towards new, more evolved ways of being. I want to explore art as a verb that contains other verbs, perhaps all verbs at once. Time is art is not only about the finished art “product”, but about the mental, emotional and energetic preparation for art and how it’s the same way we prepare to live the best life with the most joy possible. It’s about committing oneself through endless practice, study and sacrifice, while also learning how to let go and surrender to the force of orgasmic creation BOOMS that take us to the stars and back down again. We learn what it means to ground out and go deep inside, to the root of who we are, even if that root turns out to be a hollowed out tunnel. As denizens of a sick and dying culture, we must face the (difficult — yet, liberating!) reality that much of our so-called self is empty space connecting us to consumption and communication nodes. We’ve become placeholders. Stopgaps. Mere cogs in the capitalist machine. But not for much longer. When time equals money, dreaming is seen as an indulgence — a “waste” of time when there’s “real” work to be done. Now we’re learning that the “real” work of being human isn’t building empires — it’s heart work. We have to heal ourselves and the world. And heart work requires we have space in which to dream, which is what I want this blog to be. I want other people to join me, as contributors and curators, so let me know if you’re interested. I don’t know what it all should look like yet, but in the spirit of what I’m doing I’m not waiting until I have it all figured out. We can share words and images and sounds beamed into our hearts. Information channeled from non-ordinary states of consciousness. Whether through extreme sports or psychedelics. Falling in love and falling through the rabbit hole. This is a space not for describing the problems we face. That is being done elsewhere, in endless, anxious loops. We’re going to presume that a certain amount of wokeness is a pre-condition for experiencing time as art. Eyes open to the situation and hearts open to the solution. Where is the original post? Where can we follow her blog? Iconoclast: In the paragraph starting with On this blog, On this blog is linked. So is the TimeisArt link at the end “the link.” I kept everything intact as she had it. Just ‘randomly” deciding to read this evocative post is a synchronous reminder that I will soon be publishing my review of the intriguing film ” Time is Art”. Don’tcha love when that happens? Enjoy the article. If Time is art, it explains the way they have been changing what ‘art’ is and disfiguring it as well as redefining it as they now put out ‘crap’ as art…so what does that mean for time? Very interesting article.